EVE Vegas embodies the potency of the EVE community. Born from the will of players to connect, the now CCP run event is only outdone by Fanfest itself. In many ways, it is the North American version of Fanfest. New trailer, new SKINs on the horizon, updates to the recruitment program, return of the EVE store, a brand new 90’s style hit from Permaband, new player-inspired AI and NPC presence in New Eden (as well as the Strong Boxes they carry), an overhaul of Defender missiles to an anti-bomb weapon system (DICKS), Engineering Complexes and near-future updates to citadels, community fittings, further details on Inception (the new NPE) – many things were either announced, further defined or proposed as possibilities at the event. Out of all of this, what were your personal highlights? Was there anything that surprised you? Was there something you expected to see but didn’t? This was my second EVE Vegas and I have to say the onsite feeling was a little different from last year. Comparatively speaking, last year felt a tad moody and subdued while this year felt more enthusiastic and buoyant. If I may paraphrase Wilhelm Arcturus of the Ancient Gaming Noob with whom I spent a little time chatting, “I consider a game truly dying only when the developers have grown unenthusiastic about it.” Planet Hollywood was overflowing with ebullient enthusiastic developers. Nobody attends these conventions just to see the presentations – you can do that at home on twitch. No, people attend these conventions to gather *around* the presentations and it’s at those interstitial gatherings where the best magic happens. Much like EVE itself, the sweet stuff isn’t in the mechanics, it’s in the interactions the mechanics generate meaning, by the Arcturus measure, (and it’s pretty good measure if you ask me), EVE’s doing just fine. I attended EVE Vegas four years ago, when it was a player-run event, and though I enjoyed myself, I didn’t find the content to be substantive enough to warrant a return. 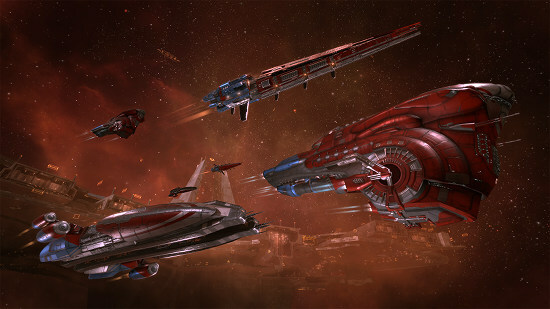 After CCP took control of EVE Vegas, I started paying more attention, and with the forthcoming release of the Ascension update, I knew this event was going to be jam-packed with interesting details on the next iteration of EVE Online. I decided I had to be there. In retrospect, I’m very happy I chose to go. EVE Vegas 2016 turned out to exceed all of my expectations. The crowd of more than 800 attendees impressed me, as it was a very diverse audience, with representatives of every type of play style. I met folks from null-sec, wormholes, low-sec and high-sec – and miners, industrialists, hard-core PvP’ers and everything in between. The only thing that I was looking for that I did not get was an updated roadmap for EVE Online development. I was hoping that CCP Seagull would describe where the game was heading in the longer term, and how her vision of stargates to new space was progressing. But the focus of CCP’s content for EVE Vegas was entirely on Ascension, and only a little bit beyond that, but no further. But that is alright, since there was plenty of meaty content to digest. I was especially impressed with simulated fittings – a far more fleshed-out feature than I expected – and most of all with the new dynamic PvE content being introduced. The new NPC mining missions in asteroid belts is a far more significant development than I think most players realize. This is the beginning of a completely interactive New Eden, and will lead to making the cluster feel much more alive. I spoke briefly with CCP Larrikin about the artificial intelligence being used with these new NPCs, and the potential for application to every part of New Eden is vast. I can’t wait to see how this unfolds over the next couple of years. But EVE Vegas not only gave me a fun crowd and excellent content, it also showed me the heart of the EVE community. Three presentations, in particular, illuminated how EVE Online affects people in ways that go far beyond the game itself. J Mcclain’s presentation on how EVE Online gave him a social support network was deeply moving. Twitch streamer Manic Velocity’s revelation that he suffers from a social anxiety disorder, and how EVE Online enables him to cope more effectively, was an uplifting message. Mynxee and Johnny Splunk, co-founder of the Signal Cartel, showed how EVE Online accommodates every type of culture and play style, even a non-violent one. I am eager to return next year. EVE Vegas showed me that EVE Online is more than just a great game, with a bright future, but a great community of really fun and interesting people. I am eager to return next year. This Eve Vegas was a bit lighter on the grand reveals but considering the massive expansion awaiting us, it was to be expected. What was to be revealed, was revealed in short fragments ripped from the greater presentations that were filled with known constants. While the Defender missile revival (and its alpha-clone ability to be used), the procedural NPC’s with their rewards or the integration of the patterning system (tldr cool skins+step closer to alliance logos) all deserve to be spoken of, my main gripe still sits with the NPE. I’m like a dog with a bone on this. If you haven’t read my older piece on the future of the NPE, written before the Sisi reveal/devblog, you can find it here. It may seem a bit outdated given what we know now, but the core is still solid, and i’ll come back to it. This was needed, and i’m glad we have it, even if i may have gone a bit differently. A lot of the niggles were addressed by Ghost in his presentation and i assume will be ironed out by the 15th (like tutorial Circadian Seekers getting renamed to prevent accidental corvette ‘splosions). I was actually reaching the point where i caught myself saying ‘you know what, it’s fine, and i guess it is pretty cool anyway’. And then CCP Ghost plopped down the future concept idea of the Operations Center and their overall view of ‘what do we do after’. You can find what i’m talking about here. There was absolutely nothing there that i liked hearing. Quantifying Eve? Quantifying character progression? Tracking specific stats that create intrinsic meaning without actually being useful in the greater Eve? Visual progression? I understand having a tangible feeling of progression is important in games nowadays, feeling like each day you get closer to a goal. But that isn’t Eve. Eve is akin to real combat. 95% nothing mixed with 5% of utter exhilaration. We ‘suffer’ through our own valleys and slumps in excitement to better appreciate and climb our own mountains. But returning to the point, the Operations Center would function as a ‘roadmap’ of options you can choose. I think not so far removed from this particular well-known chart. Ghost just threw out ‘an exploration operation, an industrial operation or a combat operation’ as options a new player that finished the current NPE might be engaged in. @Ashterothi and even @Niden_GMVA would argue that giving them a solid roadmap and structure would help them be steered towards playing Eve and getting out there, but i fear they’ll just end up the same L4/mining carebears in highsec. ‘Once i finish these things, i’ll try finding a corp/pvping/etc’ and we all know how that goes. We’ve seen this in the past with the various NPE’s tried. These Operations you engage in would also allow someone to get ‘a good understanding’ of what type of player you are and what you’re interests are in. You will also have a lot of stats mapping out what you tried, what you killed and other such trivialities. Maybe even achievements! The problem is… All of this doesn’t matter. None of that will put you on a path where you become a person that’s gonna think ‘yeah, paying 1000 euros to fly to Iceland for a few days to drink beer with space nerds sounds like a great idea!’. Eve doesn’t need a million players. Quoting an overused meme, it just needs ‘twenty good men’. I want to try to get those twenty good men, because Ghost apparently already knows how to get the churning masses of F1 monkeys and forever-highseccers that are as lively and interesting as the new procedural NPCs. Sounds rough? Maybe. Maybe i’m just utterly wrong. That’s also a possibility. But can Eve, not CCP, Eve, take the chance that i’m not? The closest I will ever get to this place is Fallout New Vegas.